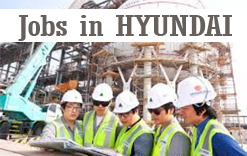 Home > UAE Jobs > Various Job Vacancies in Hyundai Engineering - Apply Now! Various Job Vacancies in Hyundai Engineering - Apply Now! Hyundai Engineering will fulfill customer value with the best engineering skills and services.HEC has performed more than 450 process plant projects worldwide including Iraq Karbala Refinery Project, Turkmenistan Kiyanly PE/PP Project, Saudi Jubail Polysilicon Plant Project, and Daesan MMA/PMMA Project. HEC provides top quality service that meets the world-class standards by its highly qualified. Leading Korean Engineering & Construction Company involved with Power Plant / Refinery /Petrochemical / Oil & Gas / Overhead Transmission Line & Substation Projects in Middle East. Qatar Petroleum (QP) is Hiring Now - Apply! Job Opportunities in DOW - USA - Apply Now! Dubai RTA is Hiring - Submit Resume Now! Now Hiring for Riyadh Metro - Apply Now! New Job Opportunities in Aecom - Apply Now!